While dressing alike is a big deal in Asian countries, it hasn’t quite picked up here in the states. But we think couples who match are darling though! It says a lot when someone proudly displays to the world they belong with you and are, well, a perfect match. Not to mention that when you do life together over a period of time, you tend to pick up on each other’s style subconsciously anyway. Spell out your L-O-V-E with these aprons by CreativeByClair on Etsy. They are made of a polyester and cotton blend which is suitable for washing up any messes. The aprons feature “LO” on one and “VE” on the other and include your names below the letters for an added touch. What could taste more appetizing than mushrooms or onions cooked on a grill? Slice up those bad boys so they are burger ready and barbecue them in a cast iron skillet next to your meat! Not only will you avoid casualties but you could even cook them in a savory sauce or gravy. Now, that’s a way to add flavor! Think these skillets are only for side items like vegetables? Nope, think again. Epicurious.com suggests cooking meat in these skillets, as featured their article about burgers. No more lost juices or flame flare-ups. You may have heard that oysters are an aphrodisiac. This belief stems from the biography of Giacomo Casanova who claimed that eating oysters daily gave him the energy and libido to be a seducer of women. While little scientific evidence has found a link between sexual desire and oysters, it’s still a common belief today. For those who believe in this folklore or for those who just enjoy eating oysters, you’ll want the Outset Oyster Grill Pan. It’s a nonstick cast iron with 12 spaces for half shell or shucked oysters (or mussels or clams or scallops and so on). This innovative tool for kebobs is an excellent alternative to straight sticks. These Fire Wire Skewers come two in a package. That may not sound like enough but you can fit twice the amount of food on these spears versus a traditional skewer. Plus, they’re flexible so you and your sweetie can twist them up to fit in a marinade bag and then place them on the grill when ready. And because they bend, you’ll have ample room on the grill to fit other items to compliment your kebobs. Zucchini strips, asparagus, carrots and green beans are all things that would taste delish when grilled on the barbecue. Keeping those morsels from falling through the grates is the tricky part though. Charcoal Companion Grill Clips are an ingenious way to grill your vegetables without worrying they’ll slip through to the fire. These clips are stainless steel and come in a pack of four — perfect for a party of two! Customize your veggies to your individual preferences with each clip and just remember to use the grill mitt before removing from the flame. Okay, a branding iron isn’t exactly essential but it sure is cool. Nestled between two letters (your initials of course) is a heart. How romantic! Heat this stainless steel iron in the fire and then brand your grilled epicurean designs for something as unique as the two of you. The handle is made of wood and includes a leather strap for hanging storage. When ordering with Texas Irons, you get free personalization and free shipping. Note that this product works with everything from small tabletop grills to huge cookers. Why not add in a little quality time or playful banter during the mundane task of meal prep? The two of you can play a game of tic-tac-toe or hangman while you wait for your meal. These creative placemats are perfect to set your grilled delicacies on, complete with non-slip cork backing. Just put your food on the grill and grab your chalk (which is not included). As an added bonus, you won’t have to worry if those juicy wings drip on the mat or water rings start to form because the mats are wipeable. Now that we have you covered for a delectable and dapper meal for two, here’s something to quench sweet cravings. Not much can beat a roasted marshmallow besides a gooey marshmallow sandwiched with a soft piece of chocolate oozing between two crisp graham crackers. 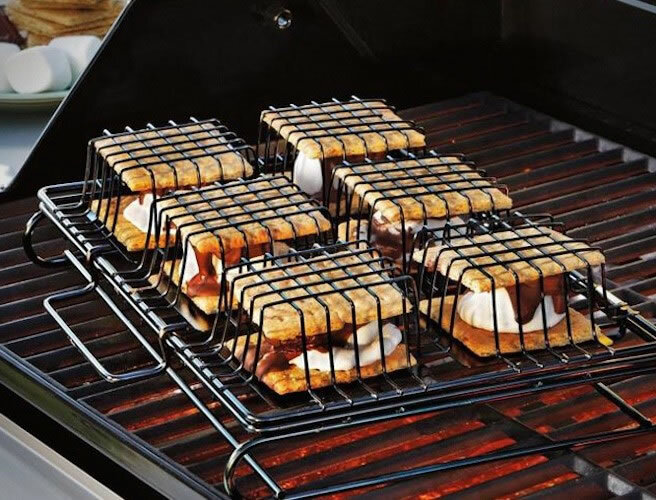 Use this Cuisinart Grill S’more To Love S’more Maker for perfectly made s’mores in five minutes flat. The maker will keep those tasty treats in place, making sure none of the gooey goodness is lost. Instead of the grill, easily create a crackling fire in your fire pit to roast your s’mores. Simply wrap your goodies in aluminum foil before placing them in their cage and over the fire. Once all that grilling is complete, take time to connect together while the Grillbot does the cleaning. This fancy contraption has three replaceable wire brushes that spin to clean off any charred leftovers from the grates. There is a push-button start and a timer with an alarm. The timer has three cycles: 10, 20 and 30 minutes. Enjoy your wine and s’mores while this contemporary machine takes care of the hard work! When the Grillbot finishes scrubbing, brushing and scraping, the brushes pop out for easy dishwasher cleaning.